1.You can wait on the (possibly icy or unshoveled) sidewalk, and climb over the snowbank when the bus comes, assuming the driver actually stops for you. Sometimes the snowbank isn’t as solid as it looks and you sink as much as two or three feet deep into it and then have to try to get on a bus quickly! Not fun! 2.You can stand on top of the snowbank, which is risky because you don’t know how sturdy the snowbank is, and you might fall in, or worse, fall into the street, just as the bus is coming! Yikes! 3.You can walk to the (hopefully shoveled) corner, then walk back on the edge of the street outside the snowbank, and stand there even with the bus stop sign. This sends the message most clearly to the bus driver that you are waiting for the bus, but can be risky if the street is slippery. Some bus drivers don’t like you to do that, though, because they are afraid of slipping and running into you. 4.You can walk to the (hopefully shoveled) corner, and wait where there is an opening in the snowbank, even if it’s not by the bus stop sign. Some bus drivers prefer you do this, and it is probably the safest way. However, you run the risk of a driver not realizing you are waiting for the bus. Currently, Metro has an “Adopt-A-Shelter” program where volunteers clean up litter around their bus shelter, report damage to Metro so their crews can fix it. What if Metro Transit had an “Adopt-A-Stop” program where people could volunteer to shovel an opening through the snowbanks by their local bus stop sign, and clean off any snow-covered benches to make waiting safer and more convenient in the wintertime? Perhaps a small reward such as a free ride coupon after each snow could be given as an incentive. 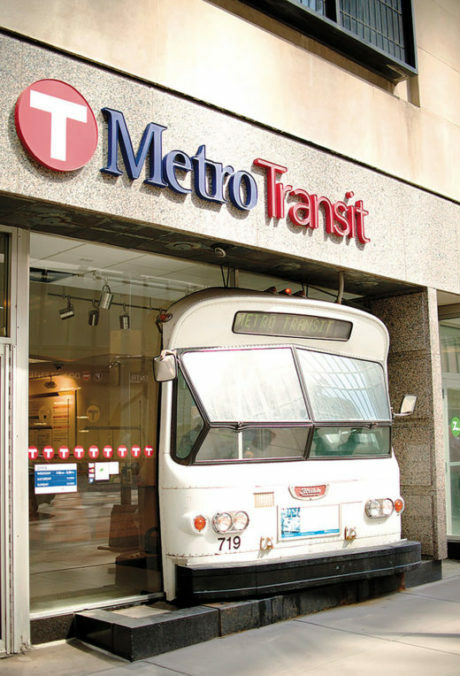 Any Metro Transit officials reading this? There’s plenty of time to implement this for next winter!